One of the top reasons businesses migrate to Xero is because they want their accounting system to be in the cloud. Cloud accounting offers many benefits such as live bank feeds, the ability of all users to log in from anywhere, and software that is automatically updated by the accounting software vendor, and no disruption when hard drives crash. However, to really leverage the benefits of cloud accounting, one needs to take further advantage of your system being online - integration. Most businesses these days are using various web apps to achieve different business functions. Maybe it’s Mailchimp for email Newsletters, Google Sheets for spreadsheets and Dropbox for online document storage. With the proliferation of SAAS (Software As A Service) solutions, there are web apps available for every function imaginable. With all of these services running on the web, there is no reason for Xero not to talk to them. In the past, integrating different web services would have required expensive API (Application Programming Interface) experts. However, with the emergence of cloud integration platforms, such as Zapier, savvy business owners or business consultants (including accountants) can now do integration on a DIY basis. Once the various web apps you or your clients use are integrated you can start implementing business process automations. This is where the real magic begins. On its own platform, Zapier refers to each individual automation as a Zap. Each Zap is composed of a Trigger App and an Action App. The logic powering each automation is as follows: If something happens in one app (the trigger) then do this task (the action) in another app. 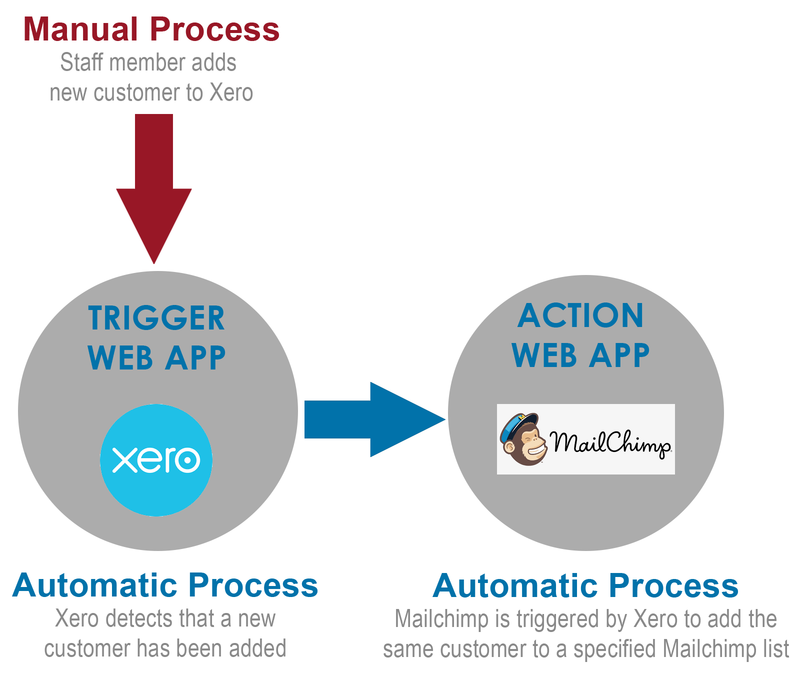 So, for example, one could set up Xero as the trigger app, so that every time you add a new customer to Xero, it instantly adds the same customer to your Mailchimp customer mailing list. This may seem trivial but at the moment it is likely being manually done by a staff member (if it’s getting done at all!) and adding up how much time this consumes over a year will reveal an opportunity for tangible savings in resources. Other benefits, once the automation is in place, include less likelihood of errors, and also faster (usually instant) business processes. The example Zap above is an extremely basic one, but once users get adept at Zapier far more complex automations can be put together. Although each automation is linked to a single trigger, there can be multiple actions, using multiple web apps, and things like filters, time delays, and conditional logic can be incorporated. New Expense Claim Receipt - triggered when you add a new draft expense claim receipt. An example of an automation using Xero as the action app would be if your client’s business is accepting payments on Paypal. Using Paypal (also supported by Zapier) as the trigger app you could trigger Xero to create a sales invoice every time a payment is received on Paypal. You could then tack on a further action app, like Gmail, and instantly send the email to the purchaser. Besides Triggers and Actions, some web apps, like Xero, also provide a Search function. This is essentially an intermediate action, as it allows the trigger app to do a search for an existing contact (by account number or contact name) before doing some other action in Xero. Not all web apps listed on Zapier (over 1000 of them!) offer as much functionality as Xero does. Furthermore, Xero seems to be actively developing more features. This makes Xero a “Premium App” on Zapier, which unfortunately means that Xero integrations are only available on paid Zapier subscription accounts. Most web apps can be used on a Free Zapier account, often a good way to start out. However, with paid subscriptions starting as low as USD 20 per month, Xero integrations are well worth it, especially when one considers that good developers in South Africa charge in the region of 5x this for one hour of their time. With more and more South African SMEs migrating their accounting systems to the cloud, accountants should seize the opportunity to add value to their services. Being able to advise clients on Xero’s integration and automation possibilities could be a valuable addition to their service offering. The opinons expressed above are those of Chris Preen in his personal capacity and do not neccessarily reflect the opinions of Find a Professional.